I try to do the long walk (3.5miles or so) from Rainham railway station to the RSPB Rainham Marshes visitor centre when birding Rainham at the weekend, and normally take the much shorter route to Purfleet railway station on leaving. Today (Saturday 22 November) I did it both getting there and coming back, and birding was not too bad at all. 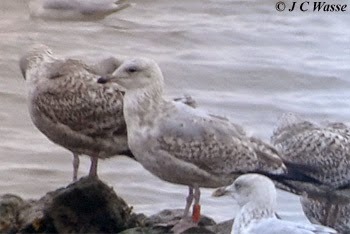 On the journey in connected with several colour-ringed Herring Gulls at the Stone Barges with the imm. in the photo the only one discernible with confidence - U0JT. Perhaps locally ringed. Wintering Ruff at Coldharbour Point, a now regular Raven overhead onto the tip and a male Peregrine over Wennington. A smart winter plumage Grey Plover called in flight at Aveley Bay where it added to the variety of waders present that included Black-tailed Godwit, Curlew, Dunlin, Ringed Plover, Redshank and Lapwing. We watched the river for most of the day from the centre's balcony. Not much movement despite or perhaps due to the dreary conditions. A Marsh Harrier crossed the river from Kent to Essex but was eclipsed by a distant Harrier on the Kent side that headed down river mid-afternoon in the mist. From what we could see we were leaning to it being a 'ringtail' Hen Harrier but it got away and out of view before we could give a positive id. The long walk back ca. 3:30pm to catch the train just before 5pm at Rainham. A Raven was on the marsh near the MDZ and a Green Sandpiper called from out of sight on the landfill. Two imm. Marsh Harrier's frequented Wennington and a Kingfisher belted past at Rainham 'West' (no pun intended). Main reason for doing this route back was to look for SE Owls just before dark from the public footpath. None showed over the Silts or nearby. Bad timing or is it simply that they are either not in, or have they been lost as a 'winterer' in this area?